Was the universe and everything in it created in six days? Among the bible-based religions of the world, this is accepted as truth as a matter of faith. For my fellow scientific minds of the world, a six day creation offends their intelligence. A large portion of the general population sweepingly accepts modern-day scientific knowledge as proof that God does not exist. A curious conclusion indeed, coming from those who are not scientific or spiritual. I boldly propose they are all wrong. God does exist, The Creation as depicted in Genesis is accurate, and science proves it. Genesis was recorded in 1450 - 1410 B.C. It had to be understood throughout the generations, which alone is miraculous. The story had to be clear enough to be understood by our pre-scientific ancestors, and still hold true when tested by the rigors of our current scientific knowledge. The contention between the religious and scientific communities is rooted in the six day creation concept. But that is not what Genesis says. Day one of The Creation is grossly misinterpreted; an interpretation ingrained so deeply in the collective sub-conscious, even those studying the Bible read it as a six day creation. What is does say, precisely, is that the heavens and earth were created sometime before Day One. Perhaps millions, billions or trillions of years before Day One, but the point is – it does not say they were created on Day One. I will detail my hypothesis in the proceeding pages, showing how Genesis and Science are not at odds with each other, but in perfect harmony. God is just a lot less verbose about it. Genesis 1 1-5 tells us God created the heavens and earth, then He was moving over Earth, He allowed light, then separated light from darkness “In the beginning.” Think carefully about this. How can this be Day One of Creation, when “a day” didn’t even exist until God called the light “day” in verse 5? One Day was not established as one day until His work of creating the heavens and earth, allowing light and then separating light from darkness occurred, which He plainly tells us took place “in the beginning.” The last line of verse 5 “And there was evening and there was morning, one day” tells us one day must have an evening and a morning; neither of which exist at the point He was creating the heavens and earth. The Big Bang Model is a broadly accepted theory for the origin and evolution of our universe. Scientists believe our solar system formed from a giant, rotating cloud of gas and dust known as the solar nebula. Most of the material in the solar nebula was pulled toward the center and formed the sun. The rest of the material stuck together to form asteroid-sized objects called planetesimals. Some of these planetesimals then combined to become the nine large planets. Scientists theorize that Earth began as a waterless mass of rock surrounded by a cloud of gas. Radioactive materials in the rock and increasing pressure in Earth's interior produced enough heat to melt the interior of Earth. The heat of the interior caused other chemicals inside Earth to rise to the surface. Some of these chemicals formed water, and others became the gases of the atmosphere. The heavy materials, such as iron, sank. The light silicate rocks rose to Earth's surface and formed the earliest crust. I am fascinated by the qualifiers used in these statements “scientists believe…”, “scientists theorize…” In other words, scientists don’t know what happened. Even more fascinating, their theories and beliefs are little more than science-speak for what was detailed in Genesis over 3500 years ago. If scientists of today do not know what happened, surely the people that lived 3500 years ago had no possible way of knowing what happened – but guess who did, The Creator. Moreover, God The Creator knew the exact words to choose that could be understood through thousands of generations with an ever-increasing understanding of the universe and our place in it. Let’s examine each point line by line. Genesis 1 1: In the beginning God created the heavens and the earth. 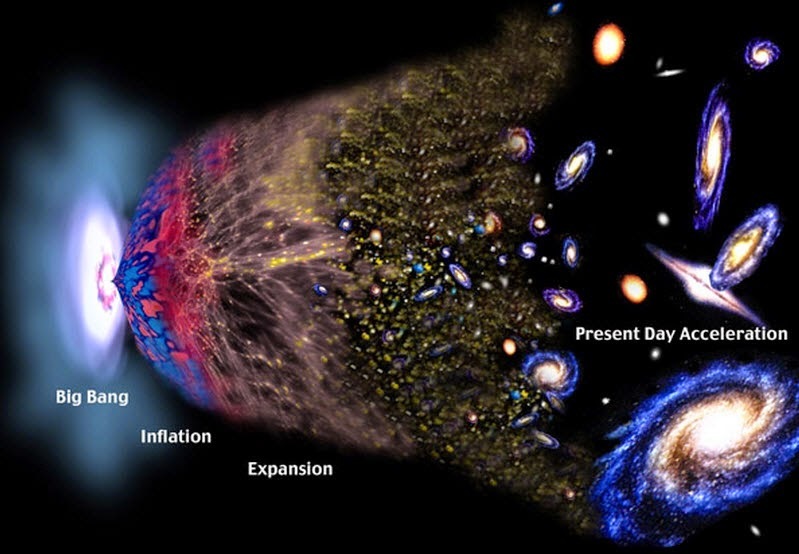 NASA: The Big Bang Model is a broadly accepted theory for the origin and evolution of our universe. The Big Bang Model blew the Bible right out of the ballgame. How can The Creation in Genesis be true? We now know a “big bang” originated the universe and all that is in it. The Big Bang Model was the tipping point. Armed with the Big Bang theory, people leaned toward science and away from God. We didn’t need God anymore, we had science. God must be some romantic notion people created to fill in the blanks. Our science now fills in those blanks, which renders God obsolete. Who fired that “big bang” gun, no one knows. It seems painfully obvious to me. The Big Bang Model does not negate God’s existence; it is nothing more than the point in time when God created the heavens and the earth. Bang! There is was. NASA: Scientists theorize that Earth began as a waterless mass of rock surrounded by a cloud of gas. This is just different phrasing meaning the same thing. Scientists describe Earth’s beginning as a waterless mass of rock. God told us the Earth was formless and void. A waterless mass of rock certainly is formless and void. Scientists say the newborn Earth was surrounded by a cloud of gas. Scientists disagree on what exactly that gas was comprised of; some “believe” the gas enveloping Earth contained hydrogen; helium, methane, and ammonia, where other scientists contend it contained a large amount of carbon dioxide. They all agree Earth’s earliest atmosphere contained little oxygen. No matter which side of the scientific fence you are on regarding the contents of those gases, the resulting soup would not allow sunlight to penetrate down to planet Earth itself. Connect that with Astronomers believing that the sun was about 30 percent fainter when Earth first formed than it is today, and what do you get? Thick envelope of gas + faint sun = darkness over the surface of the deep. Fascinating. In the 3500 years that have transpired between the recording of Genesis and today, our most brilliant minds with their most complex mathematical equations cannot offer their beloved “scientific proof.” The best they can do is theorizing established beliefs about what may have happened. They use lots and lots of fancy scientific words attempting to describe their theories, when God told us the same thing in just 15 simple words thousands of years ago. Genesis 1 3 Then God said, "Let there be light"; and there was light. NASA: Most of the material in the solar nebula was pulled toward the center and formed the sun. According to the theory, the pressure at the center became great enough to trigger the nuclear reactions that power the sun. Eventually, solar eruptions occurred, producing a solar wind. In the inner solar system, the wind was so powerful that it swept away most of the lighter elements. In other words, there is nothing new under the sun. Of our entire advanced, analytical, scientific prowess - we can’t produce an Origin of The Universe story that differs from The Creation story in Genesis.